Every year we pass by the center of the mall where Santa has set up shop and is surrounded by a magical winter wonderland. I watch the families as they wait patiently or not so patiently for their turn to talk with Santa so they can explain those bad moments, elaborate on the good, and tell him everything they want on the never ending list. I look at them with fond memories of doing the same thing with my girls when they were younger, but now they’re older and don’t fully believe in Santa. As luck would have Andrew believes in Santa! He recognizes the big man and will look at me with his head titled slightly and says, “anta?” Other times he smiles and says, “ho, ho, ho”. It’s all beyond cute! 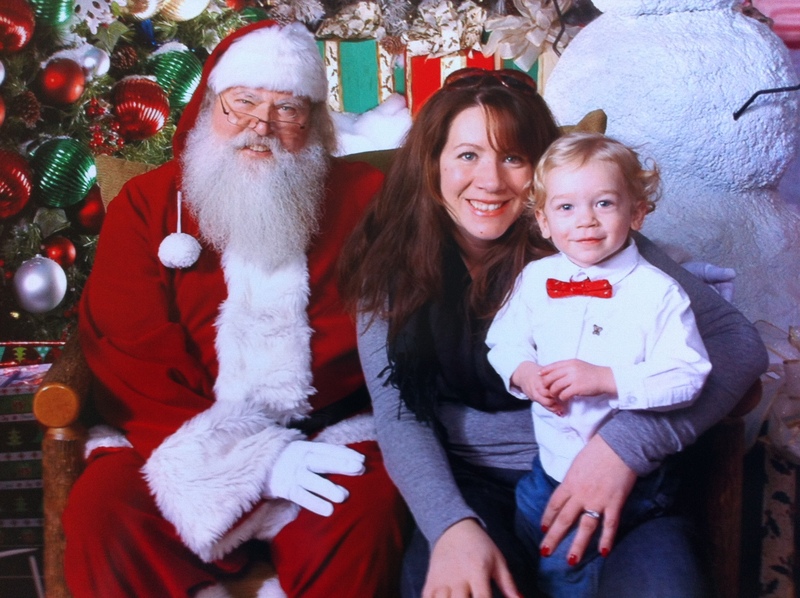 We braved the mall to have our turn with Santa. But this time I planned ahead! I didn’t want to stand in that line, weaving in and out of the ropes that help form the line, for an hour or more with a 2 year old who can’t sit still. We left early and got to the mall just before the stores opened and Santa had just arrived. We were first in line and there was nobody after us. We had plenty of time to make our way carefully up to Santa. Andrew was enthralled with the animated deer and fake snow that surrounded Santa’s chair and had to check it all out. Finally, I was able to get him closer and he stopped, pointed and said, “anta.” He refused to get any closer to the big man. This was my fear…. I really was hoping that we’d get a good picture… but he wanted nothing to do with him. Eventually we made it to Santa but it was only because I had to pick him up and walk over there. Andrew was glued to me and his little arms weren’t letting go for nothing. Nope, the cute Santa picture wasn’t happening. Thankfully the photographer was great and we got a picture! Yes, that’s me in the picture. It was the only way that we could get Andrew close to Santa. Better than nothing right? Good thing I got ready that morning!